Marine ecosystems in the Ediacaran Period were considerably different to those of the Phanerozoic Era that followed, with perhaps the most striking difference being the absence of abundant grazing and mobile animals until the latest Ediacaran, around 550 Ma. Without the disturbance by moving animals, many Ediacaran seafloors were entirely covered by communities of microbes, which formed mm- to cm-thick 'microbial mats' on the surface of the sediment. These mats, or at least their surface textures, were often fossilized and can now be seen surrounding Ediacaran macrofossil impressions. The original microbial communities would have provided nutrition and stability for larger organisms, and are thought to have been a key factor in the preservation of soft-bodied organisms. An 'orange peel' sedimentary surface texture on the surface of a rippled bed, South Australia, preserving evidence for the original presence of a microbial mat. Microbial mats are found fairly commonly on Ediacaran bedding planes worldwide, often alongside macro-fossils and trace fossils. Mats can be recognized as wrinkly surface textures on bedding planes (coming in a variety of forms commonly referred to as Microbially Induced Sedimentary Structures, or MISS), or more rarely as preserved assemblages of tiny pyritized filaments coating the surfaces of macrofossils (e.g. in the White Sea; Grazhdankin & Gerdes, 2007). Perhaps the most recognizable type of MISS is called 'elephant skin' texture, so-called for its cracked and wrinkled appearance. Microbial mats can also be recognized in thin sections cut through bedding planes, and can be identified by the characteristic way they orientate sediment grains (Noffke, 2009), or occasionally as microfossils of the original microbes (e.g. Callow & Brasier, 2009). However, many purely sedimentological (i.e. non-biological) processes can produce structures that look similar to MISS, and therefore it is often difficult to conclusively recognize true MISS in the field (Davies et al., 2016). It was suggested by Jim Gehling in 1999 that the widespread microbial mats may have played a key role in the preservation of Ediacaran macrofossils in Australia. Gehling proposed that following burial by sediment, macro-organisms were decayed by microbes already present on the seafloor, while the mat itself also began to decompose. Sulfate reducing bacteria would have broken down organic matter at the external surface of the dead organisms, producing hydrogen sulfide as a by-product, which would have reacted with iron in the surrounding sediment to form the mineral pyrite (Gehling, 1999). Rapid precipitation of pyrite on the surfaces of the organisms would have formed a "death mask" of their external morphology before appreciable decay could take place, preserving a cast or mould of the organism in the sediment (Gehling, 1999). Two Parvancorina specimens preserved on a microbial mat, in the Ediacara Member, South Australia. Gehling's model is supported by field (Mapstone & McIlroy, 2006) and experimental (Darroch et al., 2012) observations, which demonstrate that sulfide minerals can form on the surfaces of buried carcasses in the presence of a microbial mat, and that red iron oxides now observed on Ediacaran bedding planes are likely to result from modern oxidation of the original pyrite. Most recently, petrological data from Newfoundland has suggested the 'death mask' model may apply to all global localities, and that the breakdown of organic matter in the microbial mats (and formation of a continuous pyrite 'shroud' across the entire seafloor) may have additionally had significant effects on marine geochemistry (Liu, 2016), burying large quantities of sulfur and iron, therefore allowing oxygen levels to increase in the water column. Red staining by iron oxides, formed by the modern oxidation of a surface veneer of pyrite, on a bedding surface on the Bonavista Peninsula, Newfoundland. In Avalonian localities such as ﻿Newfoundland﻿ and Charnwood, there is little evidence for widespread active movement across the seafloor. Instead, many of the upright frondose organisms, such as Charniodiscus or Beothukis, appear to have anchored their discoidal holdfasts either into the sediment, or beneath the microbial mat that smothered the seafloor (Burzynski & Narbonne, 2015). It is possible that the presence of the microbes may have helped to stabilise and anchor the macro-organisms. Interestingly, some fossil surfaces in Australia appear to show evidence for frondose organisms being pulled out of the sediment by particularly strong currents, and these 'mop' structures can be abundant at particular locations (Tarhan et al., 2010). In the younger siliciclastic settings of the White Sea, South China and South Australia, there is evidence for mobile organisms in the form of trace fossils. These traces appear to reveal evidence for macro-organisms feeding on, or burrowing within, microbial mats. Scratch traces termed Kimberichnus (e.g. Gehling et al., 2014), and 'ghost impressions' of taxa such as Dickinsonia and Yorgia termed Epibaion (Ivantsov, 2013), have been interpreted as grazing traces of organisms feeding on the mats on the seafloor, although alternative explanations have been proposed (e.g. McIlroy et al., 2009). 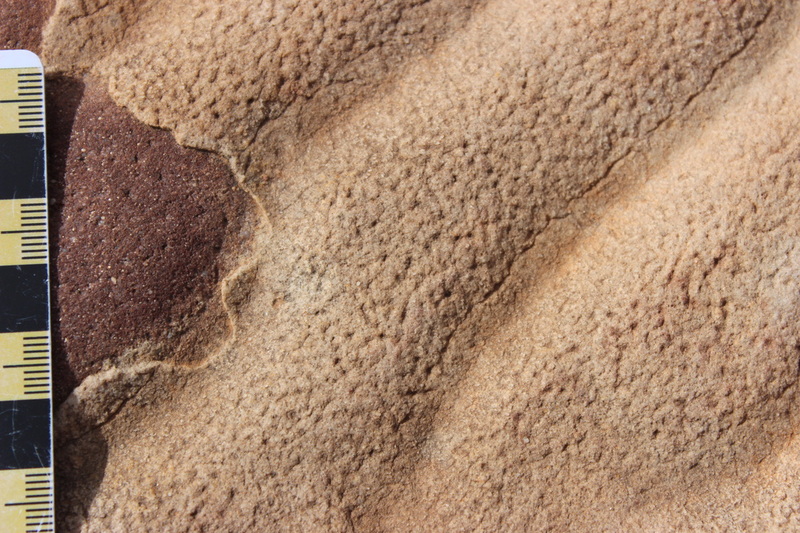 Kimberichnus 'scratch marks' (at top), interpreted as grooves made by the mouthparts of Kimberella (oval structure at the bottom) as it fed on the microbial mat. Perhaps the most common trace fossils are bi-lobed grooves that appear to reveal evidence for shallow horizontal burrows on the Ediacaran seafloor. These Helminthoidichnites traces are considered to record the movement of 'undermat miners' (Seilacher, 1999); mobile organisms moving around at the interface between the microbial mat and the underlying sediment. These traces suggest that once organisms gained the capacity to move around 560 million years ago, they quickly began to exploit the microbial mats that surrounded them as a food source. It is no surprise that microbial mats become less common in fully marine siliciclastic settings from this point onwards (Carbone & Narbonne, 2014), although they can still be found in certain Early Cambrian settings (Buatois et al., 2014), and indeed occur sporadically throughout the Phanerozoic in a range of depositional environments (Davies et al., 2016).